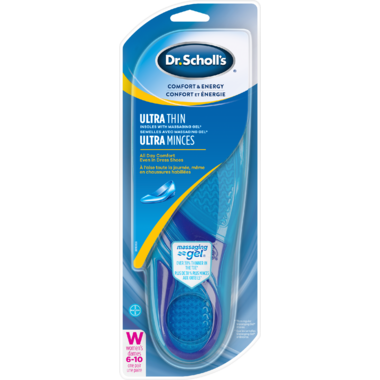 Dr. Scholl’s® Massaging Gel® Ultra-Thin Insoles provide double the comfort in your shoes*. *for those with foot discomfort. Cushion and absorb shock with blue gel. Offer superior** foot support with purple gel. 30% thinner in the toe area than regular Massaging Gel insoles. For foot and leg fatigue, the gel waves massage the foot's most sensitive areas. **versus not wearing insoles.